Brief Description: Near perfect circle rings of mushrooms or dead grass. Fairy ring is less of a lawn disease, and more of a lawn phenomenon that may lead to less attractive and possibly damaged lawns. They occur during periods of time when the soil is rich with moisture, often in late summer, and they will continue to grow larger every year. There are some fairy rings that have reached well over 150 feet in length, although many started with as little as a few feet. 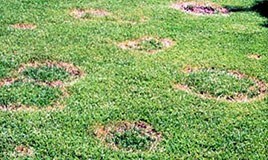 Fairy rings are one of the more unusual lawn diseases as they do not necessarily kill grass (although they may if the grass is unable to get nutrients), which differs from many other types of fungi that destroy grass quickly. However the rings of mushrooms are so pronounced that they can be very unattractive, and unfortunately they are often hard to kill, making them one of the more difficult lawn diseases. Interestingly, scientists are not entirely sure what causes fairy ring to occur. Fairy ring is a ring (or arch) of mushrooms or other fungi that seems to grow in an almost perfect circle out of the ground. There are over 50 different types of fungi that can create fairy rings, but the rings themselves can be easily recognized by the unusual circular shape they create. Type 1: Soil is unable to take in water and the grass dies in a circular shape. Type 2: Turf appears to actually be raised as if growing quicker than the rest of the lawn. Type 3: Ring is made completely of mushrooms, although there may be dead turf. Type 3 is triggered mostly by moisture, and is more likely during times of the year when the soil retains more warm water. It’s not clear what causes fairy rings, so preventing them is also difficult. Fairy ring is best prevented through dedicated attention to lawn management, including proper watering without too much moisture, use of nitrogen and the right blend of fertilizer, and aeration to reduce thatch buildup. Fairy rings that have already taken over a lawn are very difficult to remove. Ensuring proper lawn maintenance is important for those that want to avoid fairy ring, as treatment may be drastic and can sometimes be ineffective.